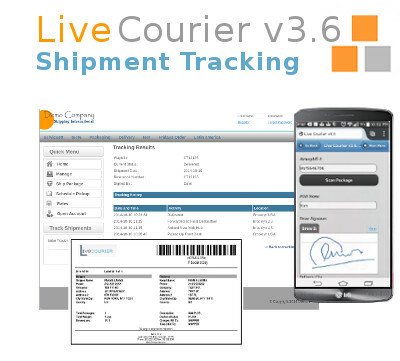 With "Live Courier" tracking module, you and your customers can track shipments in real time. From pickup to delivery point, all data is updated in real time. The moment your driver pickups the package(s) and scans the air waybill(s) your system is updated. This functionality also gives your customers the ability to track their packages in live mode from your corporate web site and/or via email/SMS notifications. Shipment tracking module is also integrated with third party couriers such a FedEX, DHL, UPS, TNT and many more. Your website will be automatically updated with live tracking data. We already support over dozen couriers and our platform is ready to integrate with any courier around the globe. And the best part is all tracking integrations are FREE of charge. Your clients can create shipments with or without logging into the portal. They can also print their own or third party labels through the web portal. Automatic tracking system will be activated for all labels. Figure 1 describes how does tracking work for self delivered packages by your company or your agents. Customer creates international or domestic shipment order by logging into courier's web portal and print out the shipping waybill. Messenger picks up the package and brings into courier's office or warehouse for processing. Courier office forwards the shipment to an either international or domestic destination. Courier's office/agent delivers/forwards the shipment to the receiver and updates the POD information into the tracking system. Figure 2 describes how does tracking work for packages shipped via Fedex, DHL, UPS, TNT or any other major courier. Web portal comes with tracking module installed. 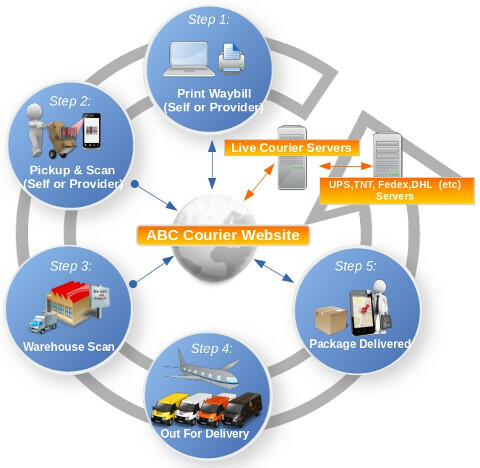 "Live Courier" software automatically tracks Fedex,TNT,UPS,DHL,USPS shipments, updates web portal and control panel. Other couriers can also be integrated to our system FREE of COST. No need to worry for shipments you forward to third party couriers. For self-pickup, you can simply scan labels for each step and update the system in real time. Your clients can access to live tracking data. Customer creates international or domestic shipment order by logging into courier's web portal and prints out the shipping waybill. Courier office forwards the shipment to an either international or domestic destination via 3rd party carrier. 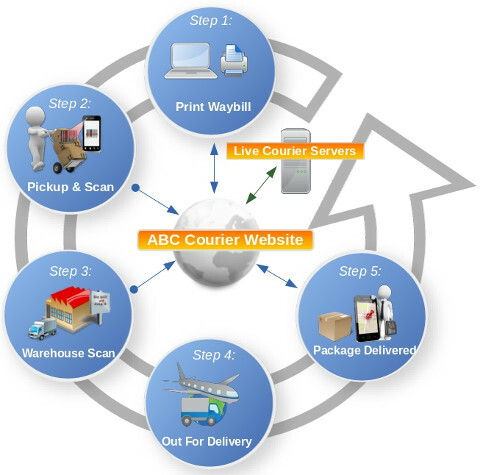 Live courier software servers pulls out the tracking data from carriers' server and transmits updated data to your system.